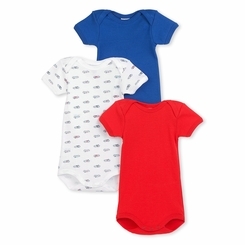 This set of three baby boy's short-sleeved cotton bodysuits features two plain bodysuits in trendy colours, and one bodysuit with a small car print. We take notice of the practical envelope neckline, which makes dressing baby a breeze. Material: 100% cotton.